The good, the bad and the ugly! Not necessarily in that order! I've seen some interesting critters the past couple of days. Last night our next door neighbor's 6th-grade son rang the door bell and held out a jar with a huge insect in it. 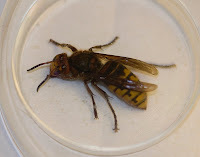 Upon further inspectio n, I realized it was a large hornet. 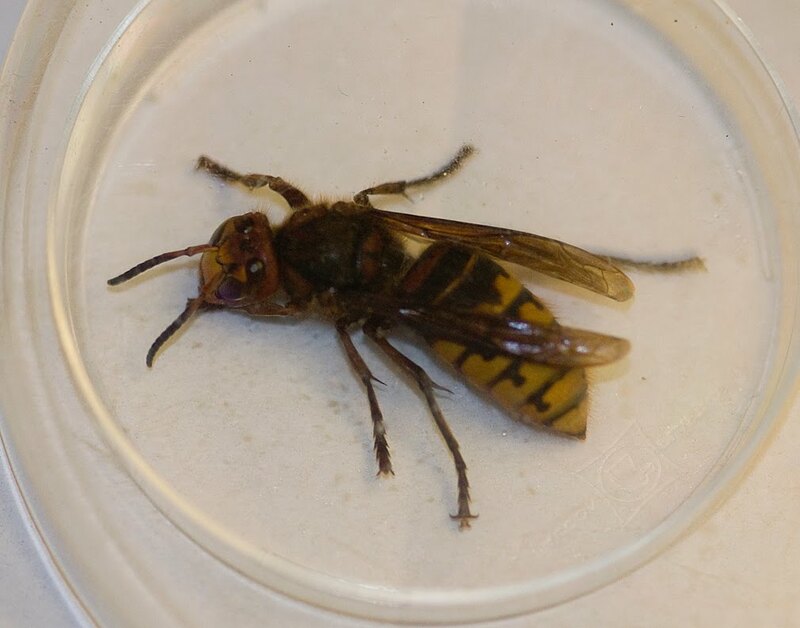 I looked it up in one of my insect guides and found out she was a Giant Hornet. 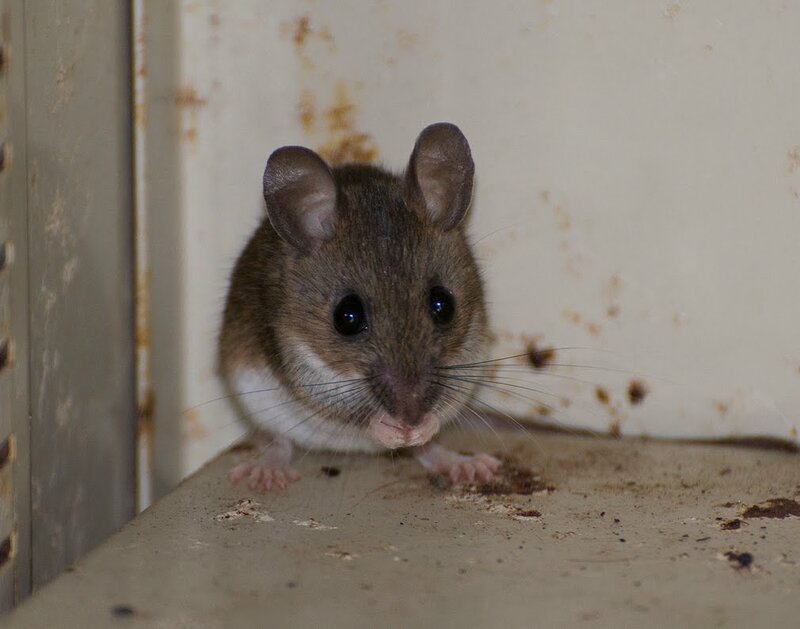 I carefully transferred her from the jar to a couple of large petri dishes. It was a tight squeeze for her, but I wanted to get some photos. 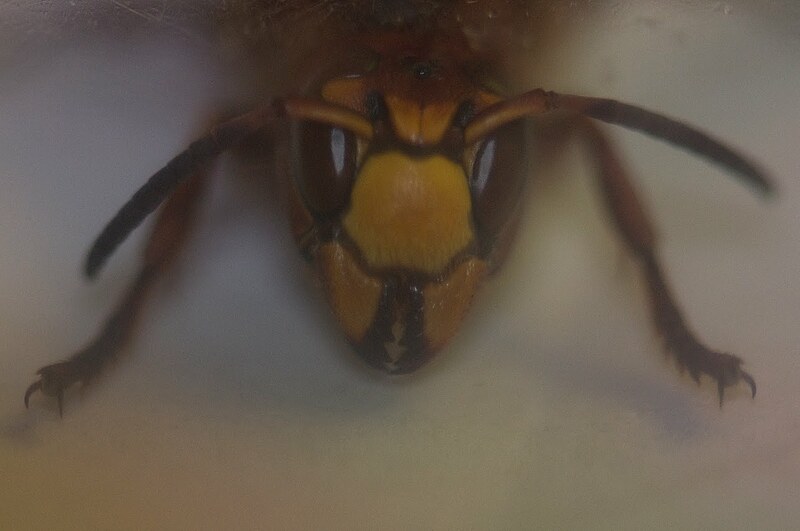 I liked this one of her head, check out those huge mandibles! The wasps use those choppers to eat insects and to chew wood fibers to make their nests. As scary as hornets are, they have a useful function in their ecosystem, they eat lots of caterpillars. 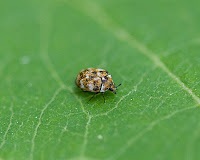 Another insect I saw yesterday was a tiny Carpet Beetle, it was walking on a milkweed leaf in the yard. These insects can cause problems if they get into houses. Later this afternoon 2 girls from the neighborhood came to my door with a tiny bird th ey had found on the sidewalk as they walked home from school. 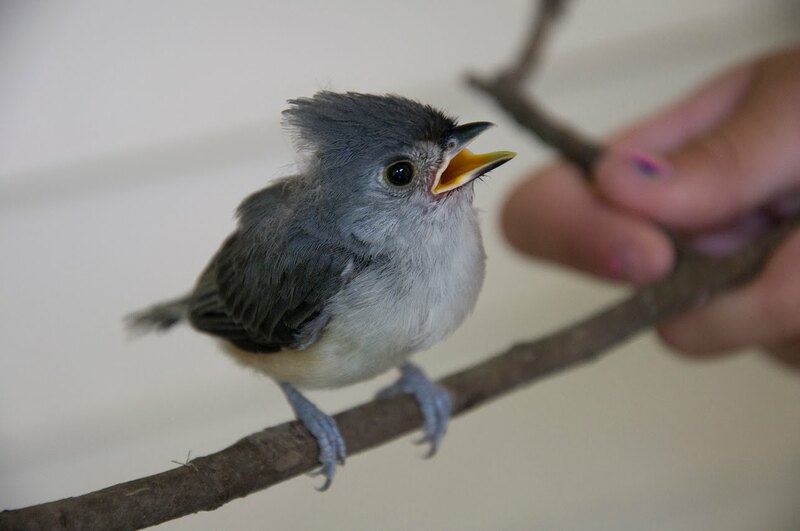 It was a Tufted Titmouse fledgling. It still had a few of its "baby feathers" on the back of its head and the corners of its mouth were still yellow and orange. The front of the beak was turning black. Baby birds often have brightly colored mouths to give their parents a "target" to hit when feeding them! 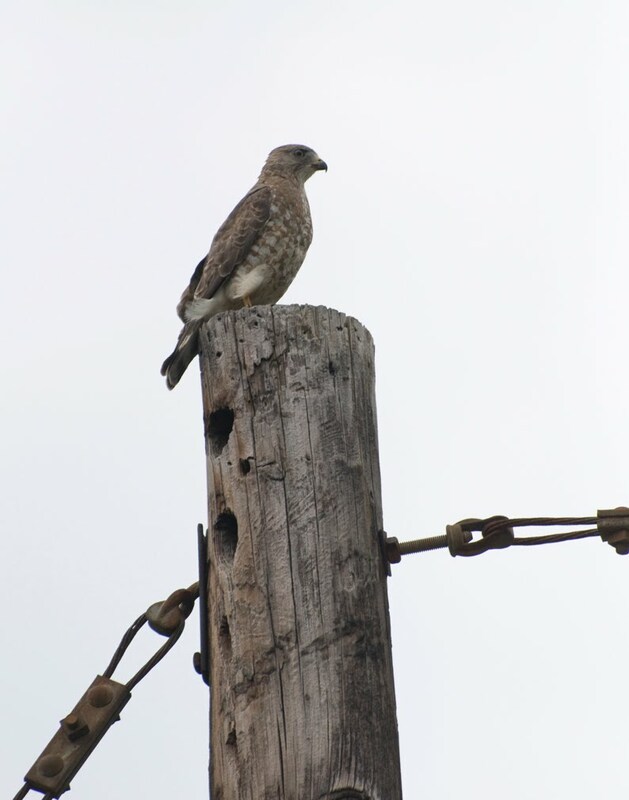 Last but not least, I saw a juvenile hawk as I was leaving Freels Bend earlier today. It was sitting on top of a utility pole. 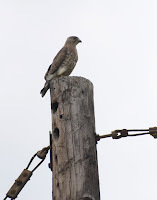 My guess is that it is a juvenile Broad-winged Hawk. If I find that is incorrect, I'll change it. Last week I went to go visit my niece and her boys in Maryville. 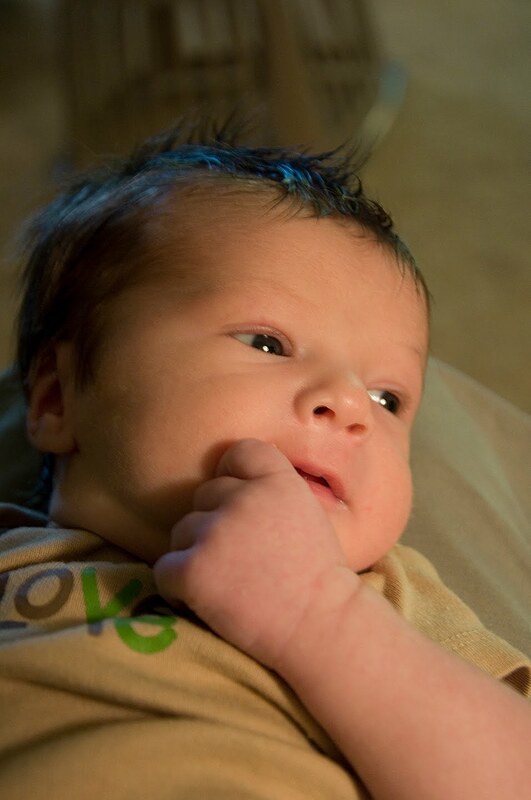 Little Riley was 10 day s old that day. I want to try to see him and Cash as often as possible, they grow so quickly! Cash and I went out to the woods near their yard and had "an adventure". 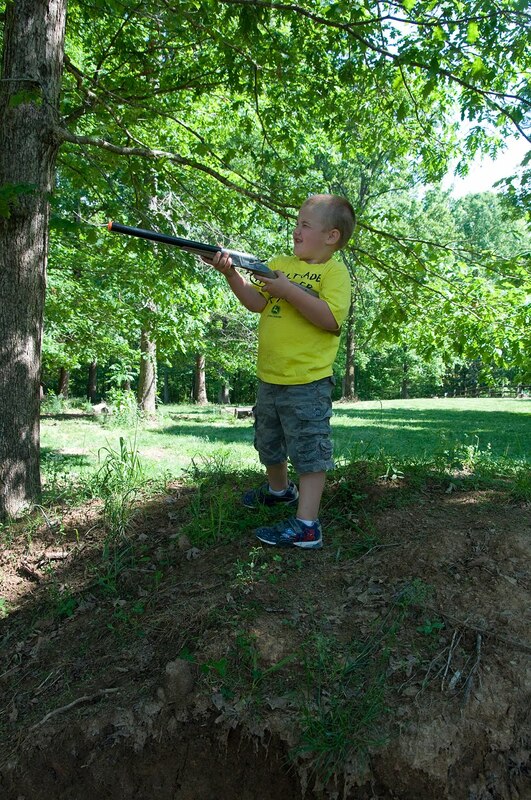 He took his plastic shotgun in hopes of finding some deer to hunt! No luck! We also had fun watching ants clearing soil from their nest. I had a hard time convincing Cash not to stomp on them! I tried to explain that we were in their home when we are in the woods. It is hard to reason with a 4-1/2 year-old boy though! He is ALL BOY too!